I’ll start with myself, since I don’t claim to have anything to hide. I had re-joined CFI Canada last summer, opting to take advantage of the student rate with discounted subscriptions to both Free Inquiry and Skeptical Inquirer. After months of receiving no magazines and in light of the additional turmoil, I requested a refund for my subscriptions. After a bit more of a wait (due to the changes in leadership), interim National Executive Director (NED) Michael Payton called me, apologized for the delay, and said my full membership refund was in the mail and I was removed from all CFI mailing lists. A new executive director has been hired for Vancouver. I met David Gordon last weekend and he seems like a nice and enthusiastic chap. He wants to see collaboration and cooperation between the various groups, which is good. I have the sense he’s still learning the ropes of how to build this local group, so it will be interesting to see it grow again. CFI’s Committee for the Advancement of Scientific Skepticism (CASS) continues to chug along. Just yesterday they issued a press release exposing climate change denialism in a course at Carleton University in Ottawa. This facebook group will be used to organize volunteers of a new coalition which will present an alternative and balancing point of view on gender issues like parental and custody rights, violence, education, health, safety & security, poverty and the workplace. The coalition shall focus on major public educational events and outreach campaigns to finally bring these issues into the living room of every family in Canada. This Canadian Men’s Rights Coalition (CMRC) is the result of 2 years of carefully thought out and planned strategy considerations and 10 months reading over a dozen books by the leading men’s rights champions. When I do things I do them right and BIG. So if you’re interested in helping found this group, of which I am dead serious, contact me at justin.trottier@gmail.com. Our plan is to host a major debate in September "Is Society Anti-Male" followed by issue specific lectures throughout the year: poverty, health, violence, safety, etc. No sources are presented for any of the stats. They may exist but are likely biased. I find it hard to be outraged that “men now account for under 60% of undergraduate enrolment”. Either their stat is wrong (and they spelled enrolment wrong) or they truly hate the fact women are attending PSE. 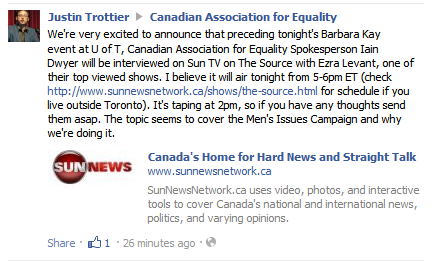 They clearly recognized the the “Canadian Men’s Rights Coalition” was a bad name, but not so bad that they forgot to change it in the group description. Trottier lists his own email as the contact. Perhaps the Board of CFI Canada doesn’t care about Trottier’s involvement in MRA activism but I point it out (again) here for those members, volunteers, and donors who do have a choice. I encourage you to write the board at directors@cficanada.ca if you have any concerns. I had a pretty big laugh when I saw they Canadian Association for Equity. It’s since been changed – but at the time the picture at the top was the same one as Justin’s site. And while Justin didn’t list himself as being involved on the about page – the contact phone number was his. All the listings on volunteer Toronto had his number as well (the same one that is listed for all CFI things, so googling it will link that two, I’d imagine). It’s good that he’s obviously seen that it can be a detriment to CFI’s image (really I think it’s about his own self image, though…) but he’s not fooling anyone. That crappy podcast still is all about him…and as you’ve shown it’s so easy to link him to it. I’m going to my first CFI event in almost a year tonight … and only because it’s on campus so it’s convenient to get there. It’ll be interesting to see Justin for the first time since I publicly and repeatedly shamed him online. …Maybe I’ll bring him a cupcake so he doesn’t spew venom at me. Katie, you win the skeptic gossip investigative journalism award. Oy, this again? Some things never change. Thanks for the post, Ian. I get two or three email messages a week from CFI or Jaimy Warner the Toronto branch leader with info about what’s happening and sometimes I post the info on Canadian Atheist. I guess you are attending Faithless: Better Without God (How Dan Barker lost his faith in faith) tonight. I’d love to hear your thoughts/reaction. Are you still able to post on Canadian Atheist? If so, would you consider submitting a guest post? I’m not to happy to see that he still continues to advocate for men’s rights. I’m uncomfortable with the fact that CFI’s National Outreach Coordinator believes that men need to gain or regain rights. It will be difficult for CFI/Justin to reach out to women (pardon the pun) if Justin continues to be a men’s rights champion. Ian and Rebekah – 😀 I take pride in my finely tuned girly-attack-and-gossip skills. Veronica – for a lot of reasons, I will probably never post on Canadian Atheist again – at least until Zak shows use of the money that FAC gave to him (ie: the scholarship he said he’d give out…) but likely not even then. That’s just my biggest beef. And besides – the hubby and I ditched the event to go eat greasy fish n’ chips at the campus pub. That’s a horribly written sentence, but assuming it means there’s more funding for breast vs. prostate cancer: perhaps it has something to do with the fact that breast cancer tends to be more aggressive, killing on a timescale of months to single-digit years from diagnosis, while prostate cancer kills on a timescale of years to decades (my understanding is that, in older men, the choice is often not to treat it, as you’ll probably die of heart disease first). Rationally, funding should be triaged by risk. I see Justin was a speaker at the CAE meeting at U of T the other day. A friend was live tweeting the “event” and it was exactly as sad and delusional as one might expect. Justin and Barbara Kay on the same stage…Glad I stayed home. The more significant downside to Justin’s continued role (in any capacity) with CFI is that his advocacy for crackpot groups damages the CFI brand and reduces its ability to draw members from a wide base.